The Gorgeous Roman (Indoor) Pool! On our trip to see Hearst Castle we did Tour #1 (the Experience Tour), which gave us a nice overview of the grounds/houses at Hearst Castle. The last stop on our tour was this absolutely *gorgeous* indoor pool! I managed to make friends with the tour guide and she let me lag behind and take a couple photos when everyone else had left. 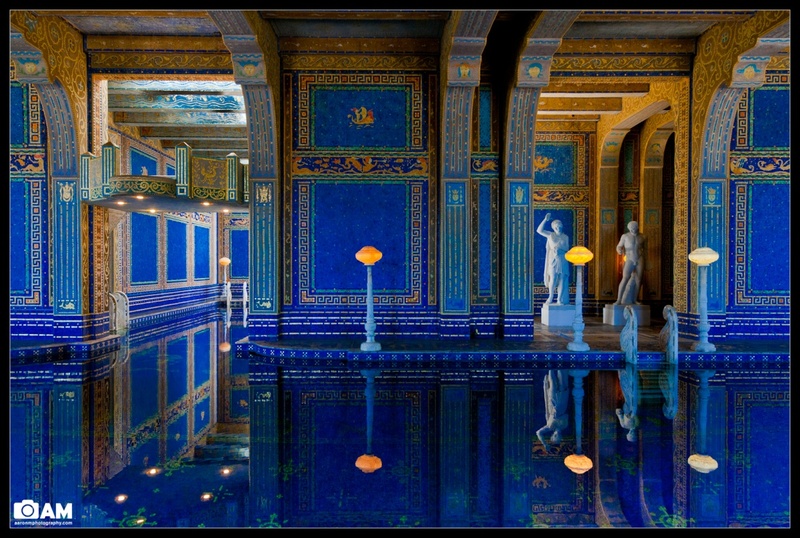 The Roman Pool at Hearst castle is a tiled indoor pool decorated with eight statues of Roman gods, goddesses and heroes. The statues are rough copies of ancient Greek and Roman statues. One such copy represents the ”Apoxyomenos.” Statuary. The pool and surrounding room, which were built from 1927-1934, can be compared to an ancient Roman bath. The pool, like the baths, is located indoors. Its water was heated as in a tepidarium. However, in Hearst’s complex there were no hot or cold baths as there were in the ancient complex. The Roman Pool complex was designed to contain an exercise room, sweat baths, a handball court and dressing rooms. The Roman Pool is decorated from ceiling to floor with 1” square mosaic tiles. These glass tiles, called smalti, are either colored (mainly blue or orange) or are clear with fused gold inside. The intense colors and shimmering gold of the tiles combine to create a breathtaking effect. The designs created by the tiles were developed by muralist Camille Solon. The inspiration for some of these designs came from the 5th Century Mausoleum of Galla Placidia. I decided I would post a non-HDR version of this, since I was able to get the colors/sharpness in this photo that my eye saw, without having to HDR it (mainly because this composition doesn’t have any windows in it which would have blown out).